Located in the peaceful forests of Barre, MA, Insight Meditation Society is a globally-recognized meditation community. 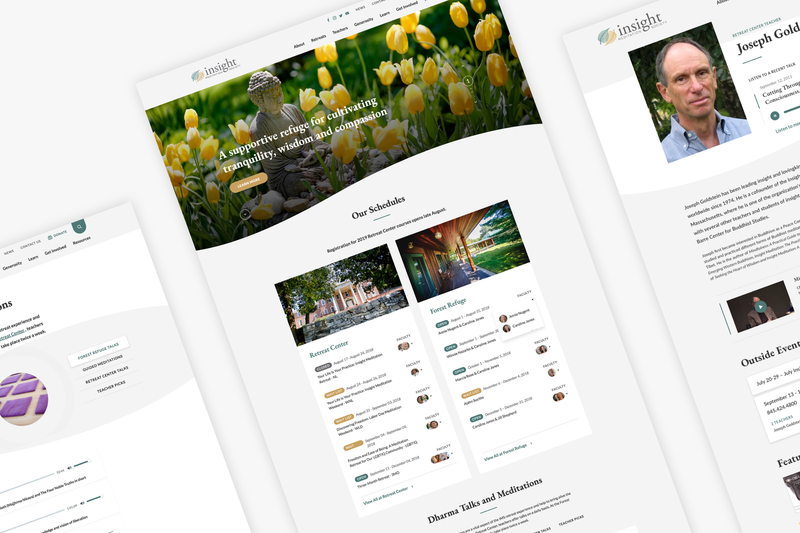 Despite its humble location, Insight Meditation Society is known worldwide, having been featured on ABC News, housing internationally known mentors, and even hosting His Holiness the Dalai Lama. At its core, IMS is a refuge for those seeking spiritual liberation and a heightened sense of self. 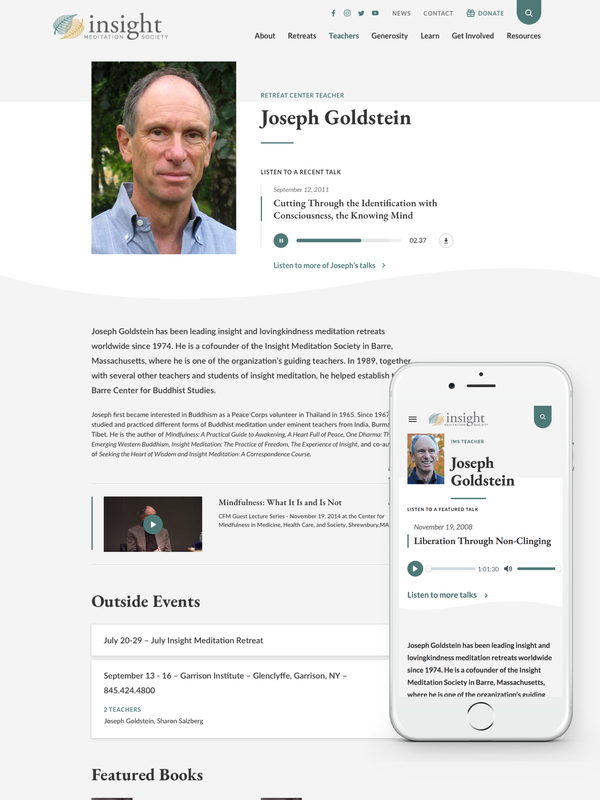 The community of 37,000 practitioners (called “yogis”) act as a beacon for experienced meditators and novices alike, embracing people of varying backgrounds and beliefs to achieve meaningful conversation and reflection. 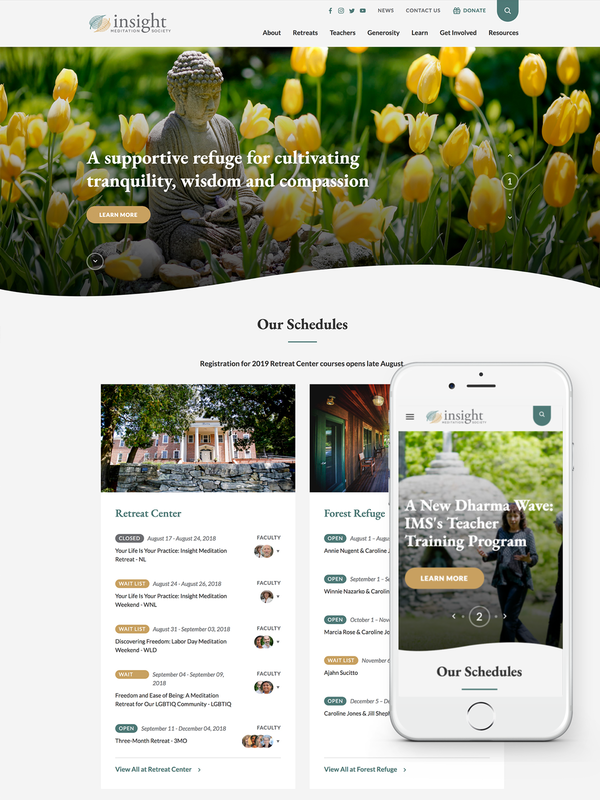 With the practice of meditation steadily on the rise, IMS needed a refined image to attract new members while still retaining their longtime loyal yogis. 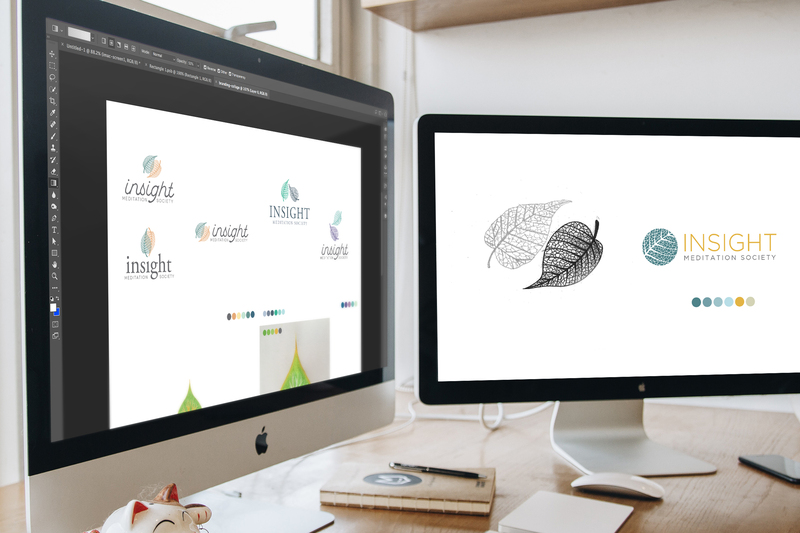 Our challenge was to stay true to IMS’s roots and portray a brand that is in tune with the modern world. It wasn’t only about capturing the spirit of meditation, but capturing the community as a whole, which is what makes IMS so appealing. The first step in crafting the foundation for IMS’s new identity was to completely reimagine their brand approach. We sat down with the IMS team in a discovery meeting to nail down some of their key objectives. We took their tagline of “Tranquility. Wisdom. Compassion.” and used it as a driving force for the new brand identity. Our goal was to inject color and clarity into their brand to reflect the some of their defining attributes – open, serene, and inclusive. 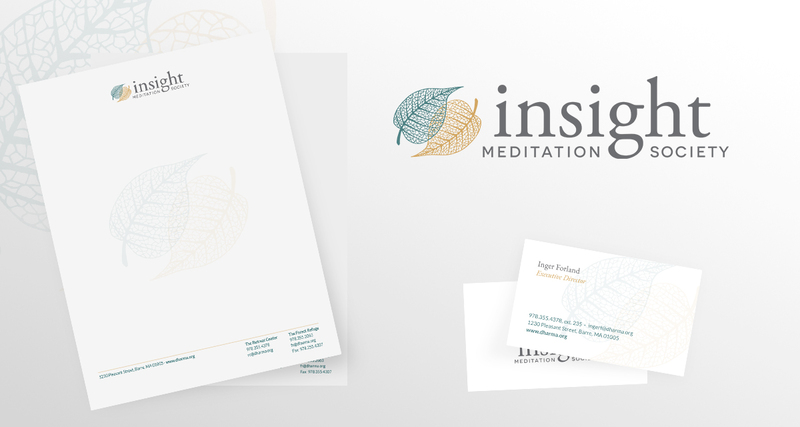 An updated color palette fused with design and typography changes helped establish IMS as an authority figure in the meditation world. After looking at the analytics data, we found that, not surprisingly, the most visited pages were the retreat schedules, audio talks, and teacher profiles. 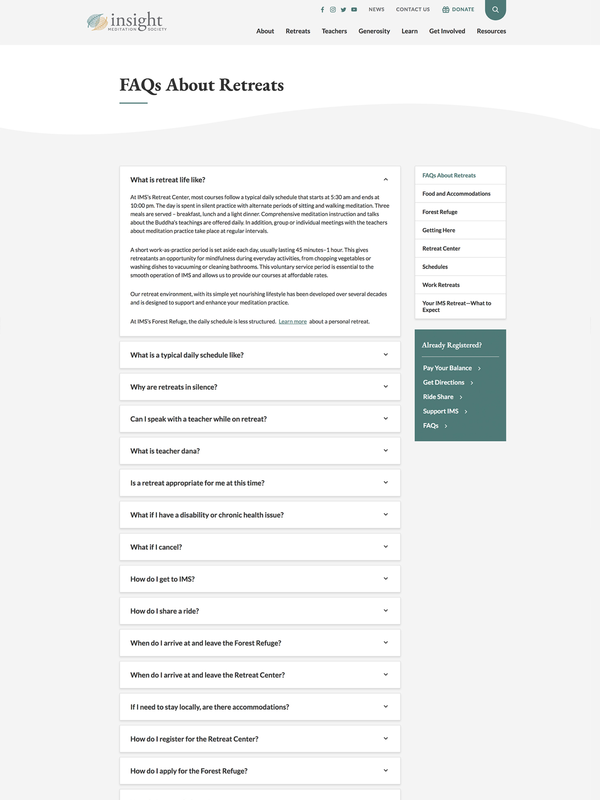 With that in mind, we planned an overhaul of the existing information architecture. The new approach eases navigation through the site and gives users a fresh and fun way to experience their most sought-after information. 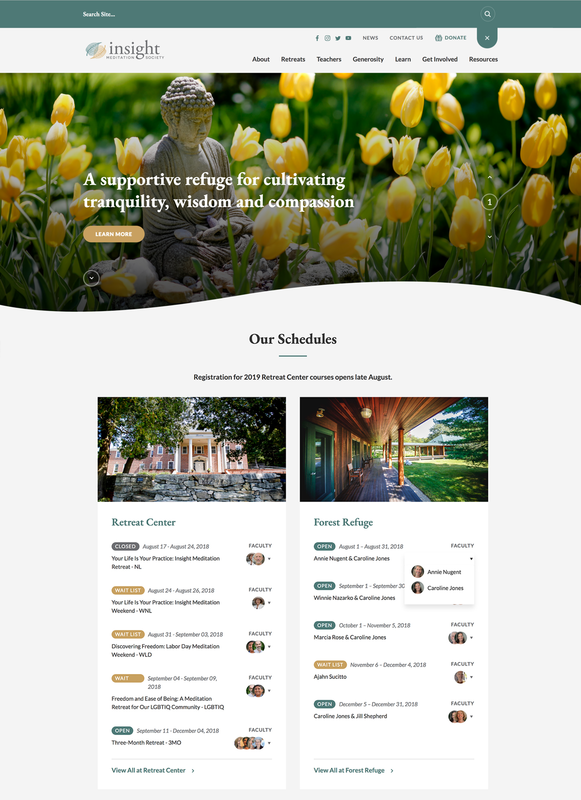 The new website aesthetic and site-wide donate buttons ultimately drives users to the two most important actions – signing up for retreats and donating to IMS. Since those functions utilize IMS’s internal ERP system, we integrated the two to allow for a consistent workflow. 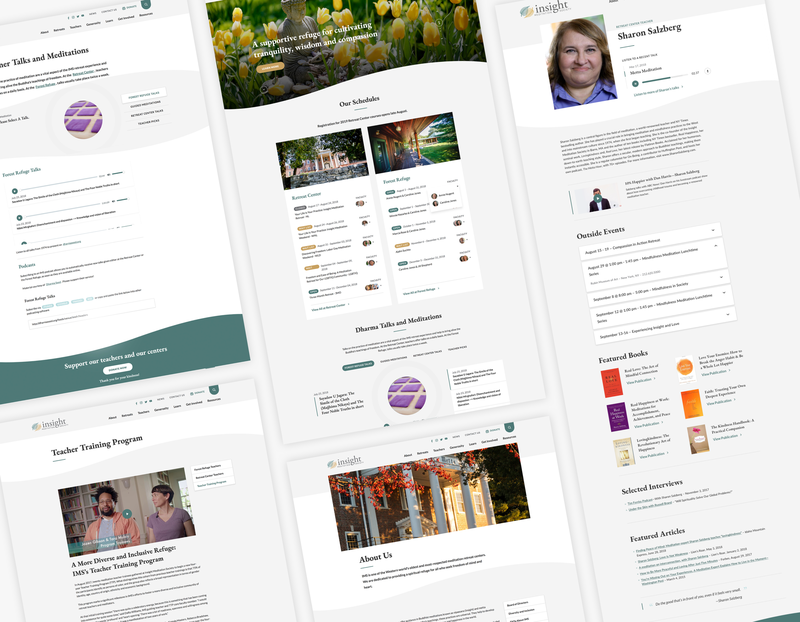 While the brand launch helped IMS get off the ground, the website redesign was very much the crux of the project. 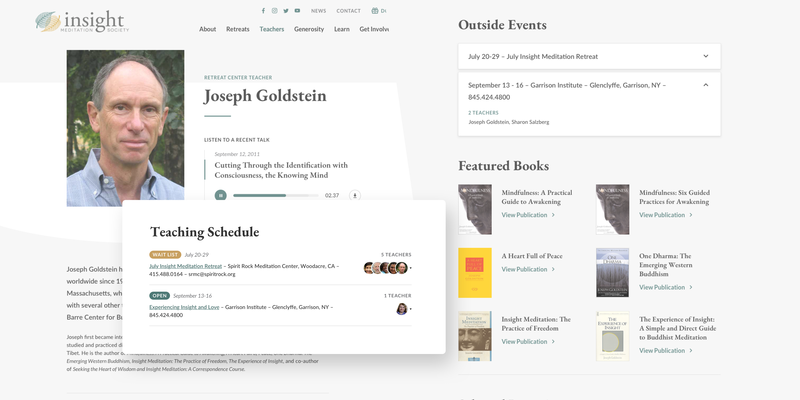 Drawing from the new brand look and the analytics data, we transformed the core content into action-driven pieces. 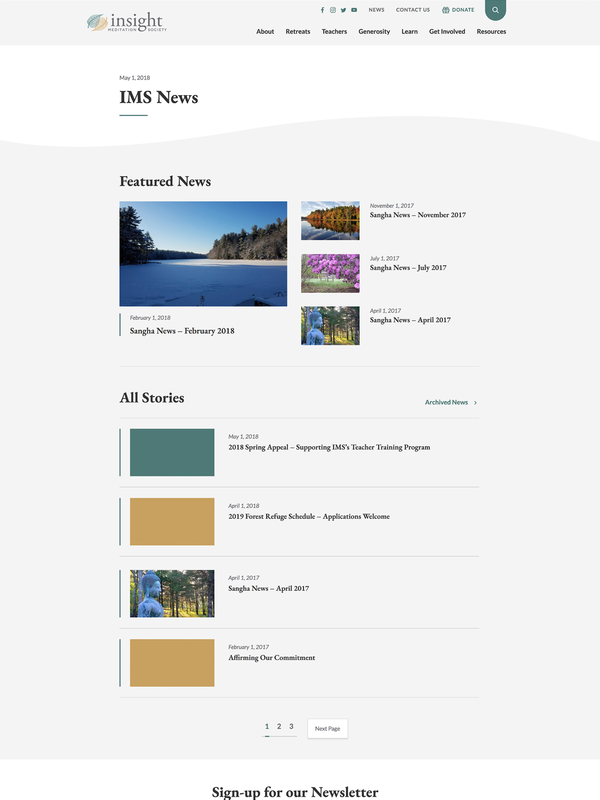 All of the necessary parts were consolidated into the homepage in conjunction with a “wavy” image slider to make the pertinent info front and center. The IMS infrastructure was built on WordPress, primarily for customization and management purposes. 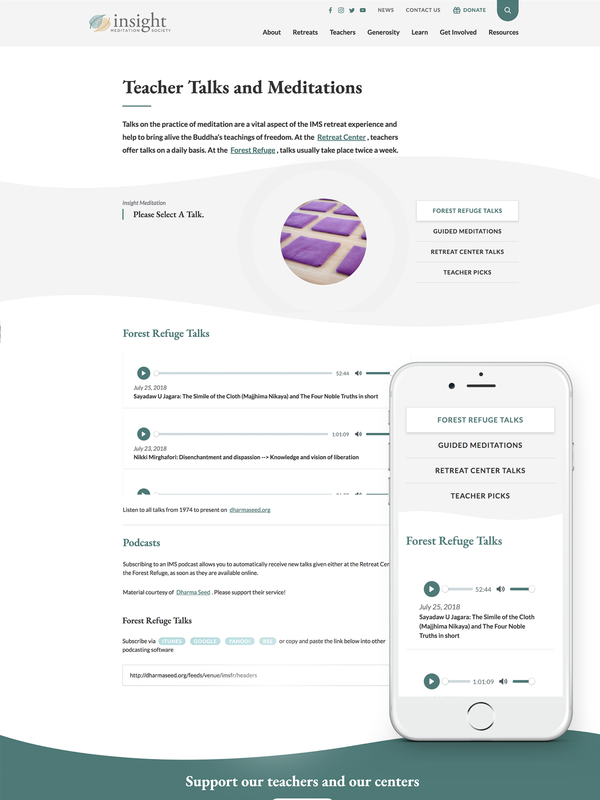 The various content types utilize a component approach in the backend, keeping everything modular yet cohesive. 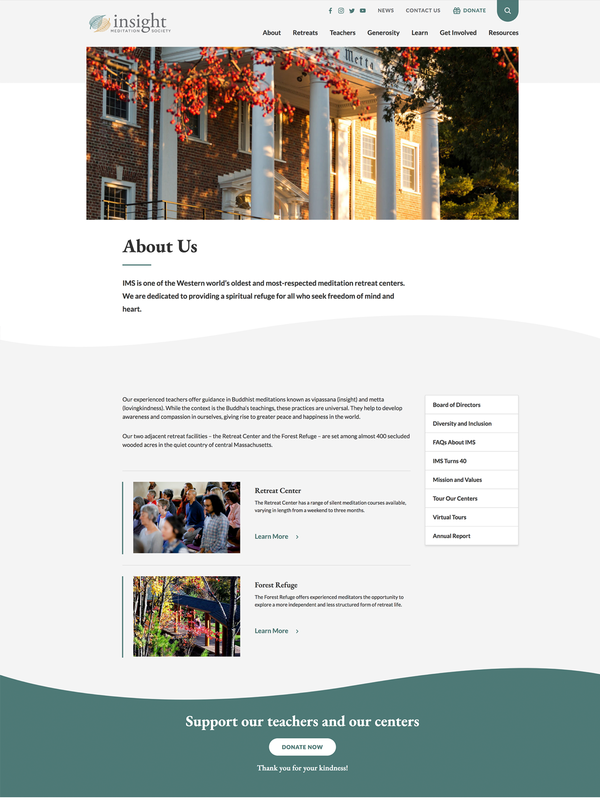 Like all of our projects, the IMS website is completely responsive, allowing for a flawless experience on desktop, tablet, or mobile. The fruits of the design and development process were components that breathe life into the IMS experience. 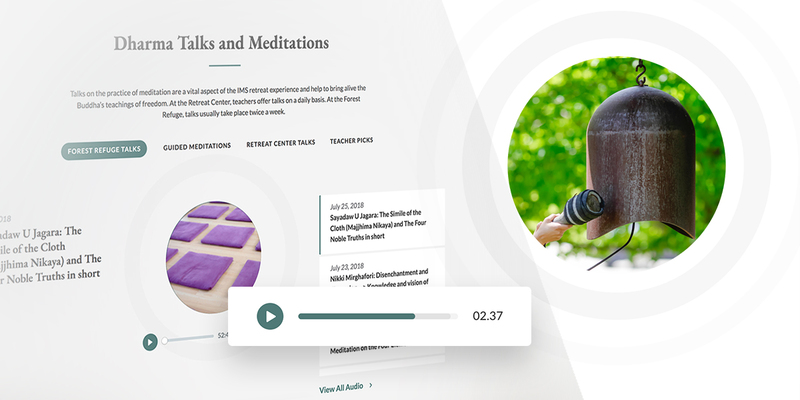 A highlight feature is the audio section which is a refreshing way to listen to meditation talks. 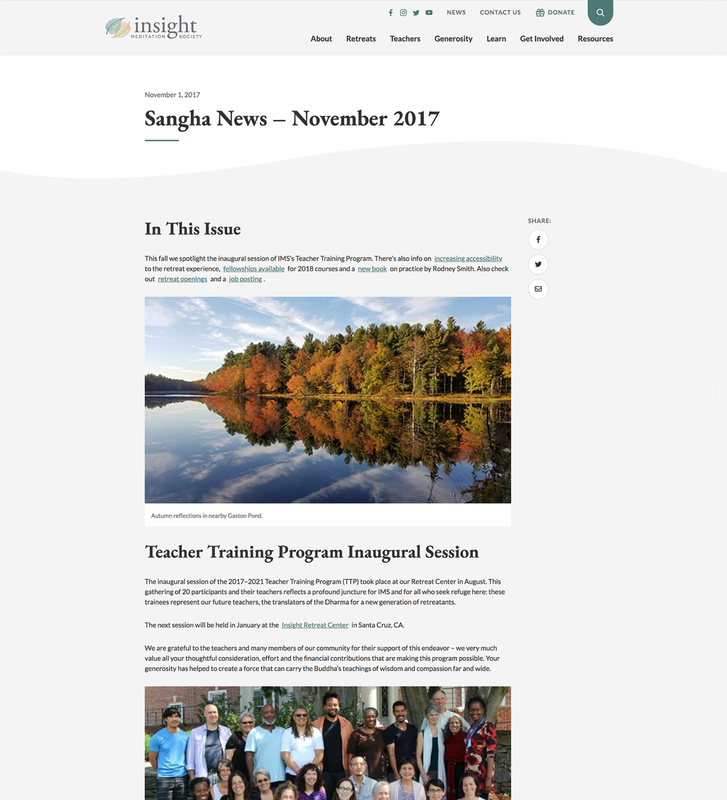 However, the entirety of the website captures their traditions rooted in classic Buddhist teachings while still meeting the demands of the contemporary world.